Waking up to hear the lesser prairie chickens booming, and possibly being lucky enough to see one is a treat for anyone who ventures out into southeastern New Mexico. However, this bird is elusive. It prefers a habitat without any large trees nearby and takes significant efforts to manage. 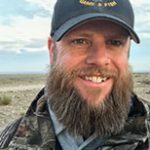 The Prairie Chicken Wildlife Management Areas, mostly concentrated in the southeastern part of the state, are large and with only a few people available to assist with habitat improvements and maintenance, the department has to seek out additional help. What better way than a collaborative effort with young adults from AmeriCorps. AmeriCorps, a national volunteer program, an endeavor resembling the Civilian Conservation Corps of the 1930s that helped young adults make money and support projects at places including national parks and state lands. This particular program, the AmeriCorps NCCC, takes young adults, ages 18-24, who commit to 10 months of team service, and stations them around the country to assist with projects that focus on environmental stewardship and conservation, natural and other disasters, infrastructure improvement, energy conservation and urban and rural development. This work not only gives back to the communities through civic engagement but offers young adults skills, training, life lessons and even a government stipend that can be used toward college tuition or pay toward student loan debt. This AmeriCorps team traveled to Milensand to help the New Mexico Department of Game and Fish, with the tasks of improving and maintaining lesser prairie chicken habitat. In approximately one month, they were able to accomplish numerous tasks that would have taken the department months to complete and would have been very costly. The group took down old fences left from the days when the WMAs were privately owned ranches, removed old gates, repaired existing fences, put up new fences and gates, removed mesquite trees and treated the landscape to prevent them from coming back and repaired water catchments that benefit all wildlife in the area. All of this included hard work, long days and some very cold mornings. The team of 11 young adults arrived in New Mexico in January to begin their volunteer work with the department. 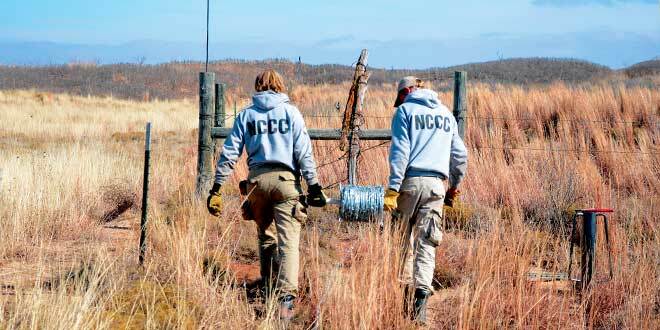 Besides just needing help at the Prairie Chicken Wildlife Area, the AmeriCorps team assisted at other department properties, including the Rock Lake Fish Hatchery and the W.S. Huey Wildlife Management Area. At the Rock Lake State Fish Hatchery, where they lived and worked for over three weeks, the AmeriCorps team installed predator nettings over the brood ponds to protect the fish and removed nonnative trees from the property. While at the hatchery, they received chop-saw training, chainsaw certification and became skilled with setting concrete. The team also traveled to Artesia where they camped out in canvas tents on the W.S Huey Wildlife Management Area. While at Huey they assisted the department farmworkers with maintenance projects around the property and built large turkey roosting stands. As a thank you for all the AmeriCorps volunteers hard work, several members of the department’s Southeast area office set up an evening to barbecue with hotdogs, burgers, chips and dessert. An archery education trailer was also on-site; some of the AmeriCorps team shot archery until it was dark. After leaving, the Huey team moved on to other projects working with New Mexico State Parks and the U.S. Fish and Wildlife Service. According to the team’s media relations person, Mike Colores, the group included people from all over the country. The team is based out of Aurora, Colorado and serves eight states in the southwest region. They were based in New Mexico through March 2018. The department is grateful for all of the amazing hard work these young adults put in to help wildlife and its habitat. If you would like more information about AmeriCorps programs check out their website at www.nationalservice.gov/programs/americorps. Cody Johnston is the Department of Game and Fish public information officer for the Southeast Area.